Al Bartlett in one of the physics lecture halls he co-designed for the Duane Physical Laboratories Complex. (Photo courtesy of the University of Colorado). 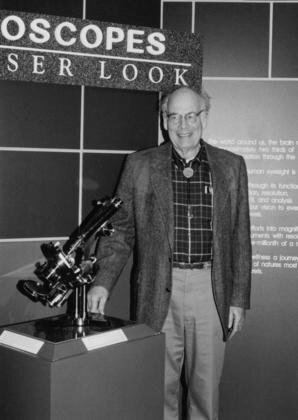 Albert Allen Bartlett, professor emeritus of physics at the University of Colorado Boulder, was remembered today as a revered teacher who had a major impact on his students, the university, Boulder and far beyond. Bartlett died on Sept. 7 at the age of 90. Bartlett started teaching at CU-Boulder in 1950 and retired in 1988 but continued to teach CU students for many years afterward. He is a former president of the American Association of Physics Teachers. When Bartlett first delivered his internationally celebrated lecture on “Arithmetic, Population and Energy” to a group of CU students on Sept. 19, 1969, the world population was about 3.7 billion. He proceeded to give it another 1,741 times in 49 states and seven other countries to corporations, government agencies, professional groups and students from junior high school through college. His talk warned of the consequences of “ordinary, steady growth” of population and the connection between population growth and energy consumption. Understanding the mathematical consequences of population growth and energy consumption can help clarify the best course for humanity to follow, he said. The talk contained his most celebrated statement: “The greatest shortcoming of the human race is our inability to understand the exponential function.” A video of his lecture posted on YouTube has been viewed nearly 5 million times. This year, the world population is about 7.1 billion and the CU Environmental Center announced a program this summer in which 50 student and community volunteers received training in exchange for a commitment to give Bartlett’s talk at least three times in 2013-14. 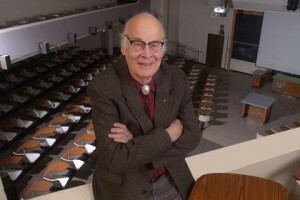 Al Bartlett began teaching physics at the University of Colorado Boulder in 1950. (Photo courtesy of the University of Colorado). Bartlett was a dedicated teacher who reveled in finding better ways to reach his students, whether it was the use of 1-inch diameter railroad chalk that could more easily be seen on a blackboard or the design of a new physics lecture hall. He served on the Boulder Campus Planning Commission for 25 years and chaired the faculty committee responsible for designing the building currently housing the Department of Physics and the Department of Astrophysical and Planetary Sciences. He and Professor Frank C. Walz designed physics lecture halls for the Duane Physical Laboratories Complex that included the innovation of rotating stages. The stages allowed scientific demonstrations to be in use during one class while they were being set up for the next — a process that might take three times as long as the 10 minute period between classes. In addition to his university work, Bartlett also was a prominent and influential member of the Boulder community. He was an initiator of the effort to preserve Boulder’s open space and also the “Blue Line” amendment that kept houses from being built farther up Boulder’s foothills by restricting the city water supply to a maximum elevation. Throughout his decades as a Boulder resident he also was a prodigious writer of op-ed pieces and letters to the editor on a variety of civic and scientific issues. Bartlett was born on March 21, 1923, in Shanghai, China. He earned his bachelor’s degree in physics from Colgate University and spent two years as an experimental physicist at the Los Alamos Scientific Laboratory in New Mexico as part of the Manhattan Project before earning his graduate degrees in physics at Harvard. He then started his teaching career at CU-Boulder. He won the American Association of Physics Teachers’ Distinguished Service Citation, the Robert A. Millikan Award and the Melba Newell Phillips Award, and served as the society’s national president in 1978. Teaching and service awards from the University of Colorado include Boulder Faculty Assembly Excellence in Teaching Awards, the Robert L. Stearns Award, the Thomas Jefferson Award, the University of Colorado Centennial Medallion, the President’s University Service Award, the University Heritage Center Award and the Presidential Citation. He was preceded in death by his wife, Eleanor, and is survived by their four daughters — Carol, Jane, Lois and Nancy. A memorial service was being planned to be held in Boulder in October.